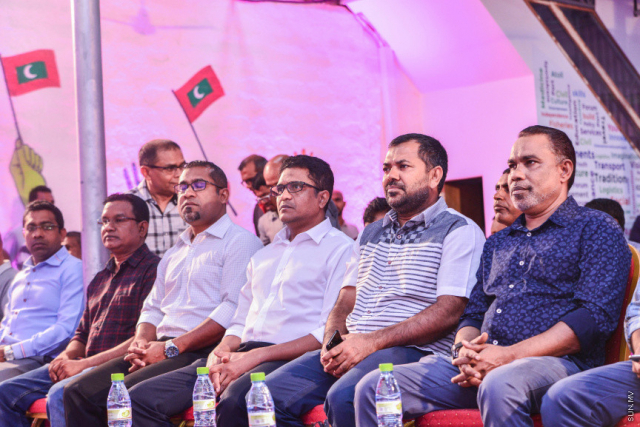 The ruling Progressive Party of Maldives (PPM) will not hold any events past 10:30 pm, starting from this Sunday, says deputy leader of PPM, Abdul Raheem Abdulla (Adhurey). At a press conference this Sunday, Adhurey said the party made the decision as proof of its commitment to maintaining peace and security within Maldives. “All our political activities will hereafter be concluded by 10:30 pm. We made the decision because we prioritize the country’s peace. So we will not hold any political events after 10:30 pm from tonight onwards,” said Adhurey. Speaking at Sunday’s press conference, leader of PPM’s parliamentary group, Vilimale’ MP Ahmed Nihan Hussain Manik said the difference between the government coalition and the opposition is that the opposition had a habit of creating public disturbances with their events. “When holding political events, we adhere to the rules and regulations and obtain necessary permits. But the opposition take to the streets and disturb the public. If they too, took proper permission and carried out rallies at permitted areas, then the police would not obstruct them,” said Nihan. Nihan also announced that PPM will be holding a special rally at Rumaalu-2 this Sunday night.